In this talk some major challenges of using Artificial Intelligence (AI) and Machine Learning (ML) for medicine and healthcare are reviewed. These include technical issues such as data-related and/or algorithmic challenges. In addition, medical/health related challenges as well as socioeconomic, cultural and policy-related challenges will be briefly discussed. The speaker then presents some potential solutions in form of novel algorithmic approaches as well as policy-related changes that can at least partially address some of these challenges. 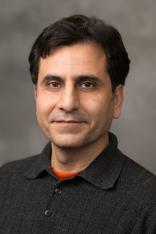 The focus of Dr. Najarian’s research is on the design of signal/image processing and machine learning methods to create computer-assisted clinical decision support systems that improve the quality of patient care and reduce the costs of healthcare. Funded by agencies such as National Science Foundation, National Institute of Health and Department of Defense, His research focuses on creating clinical decision support systems to manage traumatic injuries, in particular traumatic brain injuries, hemorrhagic shock, cardiac arrest and other critical care states. Dr. Najarian’s lab also designs sensors to collect and analyze physiological signals and images. He has several patents, some of which have been optioned / licensing / commercialized by private companies. He serves as the Editor-in-Chief of Biomedical Engineering and Computational Biology, Associate Editor of two other journals in the field of biomedical informatics, and the editorial board of several other journals in the field. Dr. Najarian has over 200 peer-reviewed journal and conference publications. He also serves as an Associate Director and Director of Data Sciences for Michigan Center for Integrative Research in Critical Care (MCIRCC), which is a comprehensive research enterprise devoted to improving the care of the victim of critical illness and injury.